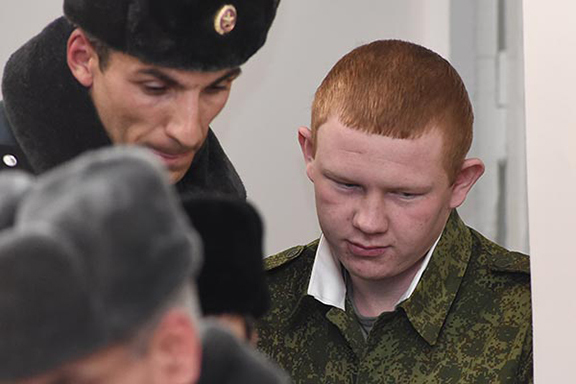 MOSCOW, Russia (RAPSI)—A court in Armenia has upheld the life sentence for the Russian soldier Valery Permyakov, who had killed seven members of a family in the city of Gyumri, RIA Novosti reported Monday. The ruling may be appealed in a month. On August 23, a court in Armenia sentenced Permyakov to life in prison. He was found guilty on all accounts including murder, assault related to robbery and attempt to cross the border illegally. The family, including a six-month-old baby, was killed as a result of an armed assault on January 12, 2015. Valery Permyakov, a soldier at a Russian base in the Armenian town of Gyumri, was arrested and later charged with the murder of two or more persons under the Armenian Criminal Code. On August 12, 2015, Permyakov was found guilty of desertion, theft of weapons and sentenced to 10 years in prison. The murder case was singled out for considering it in a separate procedure and passed to the Armenian authorities. On October 13, 2015, Permyakov was found sane despite certain deviations. According to experts, he was not in the heat of passion while committing the crime and could recognize the consequences of his actions. On October 16, he was additionally charged with armed assault, home-invasion robbery and attempted border crossing.